A science kit is a great way to get kids interested in science and to make their imaginations soar! If your child is showing an interest in science and is looking to start doing experiments, then the gift of a science kit might just be the perfect thing for them. But which one do you choose? We compiled a list of the 10 best science kits for both young and older kids that is sure to spark interest as well as educate them on the wonderful world of science! But before we look at the list, here are some things to know about STEM, what to look for when shopping for a science kit as well as some tips to make experimenting a happy, fun experience. All the kits featured on this list are safe but note that some are more suitable for older children. We made sure to provide a mix of kits so that there is a science kit for everyone. What’s in a kid’s science kit? Which science kit do I choose? STEM teaches kids more than just science and math. It can help kids become better problem solvers, get them to become more curious, help promote a positive attitude, introduce them to new and exciting concepts and much more. You’ll probably be surprised that many of the activities your infant or toddler already does are considered a STEM activity! Having your child explore the world around them is a perfect introduction to STEM. No tools required! Learning through play is crucial to young children and how they make sense of their environment. A great STEM activity for infants and toddlers is simply to provide them with different (safe) objects for them to hold and yes, even taste like crinkling paper or feeling smooth and textured balls. Once your child reaches preschool they are ready to start experimenting! Now that doesn’t mean they should be mixing chemicals together, but providing them some basic science tools is a great introduction into STEM. Some of the kits on this list are suitable for children as young as 3 and will include everything your budding scientist needs. Let kids fill test tubes with water or other safe liquid or study plants, bugs, and other things with a magnifying glass. Participating with your child and asking them probing questions is another way to get their brains thinking about science. Here are some ideas for experiments that you and your little scientist can do! Once your child is a little older the fun can really begin. Many of the kits on this list are geared toward school-aged children. By the time they are in kindergarten and first grade they’ll be able to follow simple instructions for more fun and exciting activities. Those are just a few of the many activities that children can do. But just like infants, toddlers and preschoolers, encourage your child to explore and learn through curiosity and exploring their environment. STEM toys are a great way to get kids curious about math and science, especially a science kit. But what should you look for in a science kit for your kid? But what about chemicals? Many of the kits do provide safe chemicals such as food coloring, citric acid, cornstarch and others. However, for most of the science kits, you’ll also need to go into your own kitchen pantry to find what you need to help your kids experimenting! Things like baking soda and vinegar are commonly used supplies that your little scientist will need to start experimenting. The determining factor on which one to choose is of course which one you think your child will be interested in! Does your child like dinosaurs? There are sets that include rocks, fossils, and “prehistoric” experiments. Does your child like getting dirty or things that go “boom”? Many kids’ chemistry will have everything you need to make a bottle rocket or an oozing slimy concoction. But what if your child has no clear interest in science? Perhaps they just need an introduction to science to see what interests them. The first two kits on our list are great first science kits for kids. They have a good variety of experiments to choose and may spark interest in exploring another science topic, be it chemistry, biology or something else. Science kits for kids do not contain anything that would be considered dangerous. However, many do suggest a child be a certain age or that there is an adult supervising while the kids handle the tools and ingredients. Wear old clothes and have towels on hand. Again, many of the products used in the experiment are not harmful, but some include things that ooze or contain coloring which can stain clothes. Also, having towels on hand will help in case you need to catch the overflow of an enthusiastic volcano or toppled test tube. Have a child wear goggles and/or gloves. For experiments that go boom, fuzz, splash or froth, wearing goggles or gloves will not only help for safety reasons but also get your kid in the mindset of a real scientist. Set up outside. Depending on the weather, you may want to take it outdoors. It makes clean up a lot easier and can lead to other scientific discoveries like bugs, plants and more. Think outside the box. While all the kits on this list come with instructions on how to do experiments, allow kids to use their imagination and do their own experiments. Experiments can be done by using safe household items like lemons, baking soda, food coloring and such. Let your kids take the lead. It might be tempting to step in and do the experiment for them, but resist the urge. Science can be messy and that’s okay. (For kids, that’s also half the fun!) Allowing your child to explore is the best way for them to learn, even if that means a bit of a mess. So now that we’ve taken a look at what you should look for, let’s see which science kits made the cut! The great thing about them is they won’t cost you an arm and a leg. These affordable fun kits are designed specifically for kids. Many of them do require additional supplies, but luckily, you most likely have them at home already (i.e., baking soda, vinegar, lemons, etc). So without further ado, here are our top 10 picks for the best science kits for kids! Be prepared to have your kids mind blown with this science kit, perfect to inspire kids and promote a love of science! This 20-piece kit will have kids making up to 11 different experiments including magic ooze, an underwater volcano, giant jiggly crystals and more. Note that some of the experiments will require some additional ingredients not provided with the kit, but most of the supplies needed are already in your home such as coffee filters, flour, plates, tape, pens, and the like. What this set does come with is 3 test tubes and stand, a pipette, measuring plastic scoops, baking soda, red cabbage powder, citric acid, cross-linked polyacrylamide copolymer, vegetable oil, cornstarch, cotton swabs, and sticks. Also included is an easy-to-follow science guide with the 11 activities. This set works for kids age 6 and up, but adult supervision is still required. Fun activities will keep kids interested. Can make up to 11 different experiments with this one set. Perfect gift for kids 6 years and older. Additional supplies (not included) needed for some of the activities. You won’t believe how many experiments this set can do! Kids will be amazed at what they can create with this large science kit. If your kids are interested in all things science, this is the set for them. This set includes everything kids need to make more than 70 science projects including jelly crystals, quicksand, slime and much more. This set isn’t just for chemistry though. 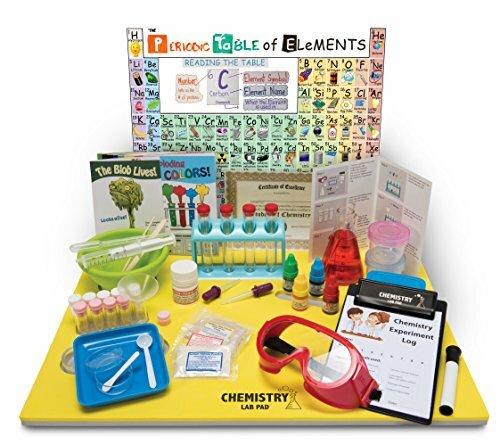 This set covers a variety of science topics including chemistry, biology, geology, physics and more, making it a perfect set for kids without one specific area of interest. There are a few science projects in this kit that aren’t quite as exciting. One of the projects is “message in a bottle” which is simply writing a message, putting it in a test tube, and having the test tube float to a friend in a pool. Another is putting a flower in a test tube vase. But there are still plenty of experiments that are fun and will keep your kids entertained and learning. This set is intended for older kids, 8 years and up. But it’s sure to have them amazed and going back for more STEM play! The science tools in this set are durable. Can make more than 70 different projects. Covers plenty of areas of science including biology, chemistry, physics and more. Some projects require additional things not included with the kit. Some of the projects are a little on the boring side. Why not let your kids hop on The Magic School Bus with Ms. Frizzle and let her teach your kids about chemistry? 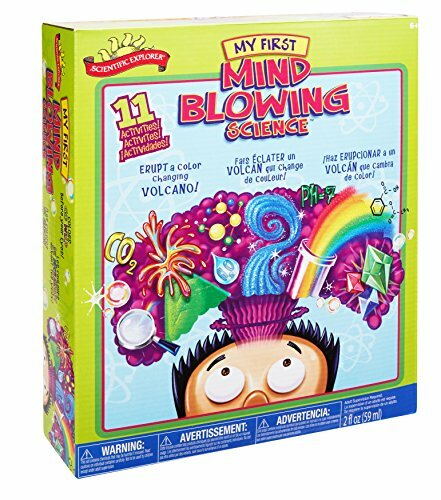 This fun educational kit will have kids making bouncy balls, slime, bubble sculptures, an exploding volcano and much more. 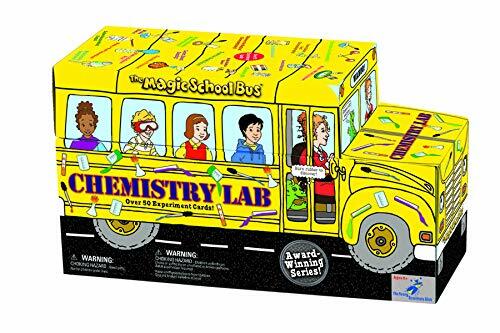 The kit comes in a school bus-shaped box and includes 51 experiment cards, a notebook to collect data and all the basic tools needed to get experimenting ASAP. The Magic School Bus Chemistry Lab is safe for kids 5 years and up. Experiment cards are easy to follow. Comes with all basic tools to complete chemistry experiments. Will appeal to kids who enjoy The Magic School Bus! Can make 51 fun and exciting experiments with this kit. Tools and cards are not very durable. Who knew science could be so delicious? When you combine science and kids favorite food – ice cream, of course – you get this awesome science kit. But this kit makes more than just some ice cream, but all the experiments are delicious. 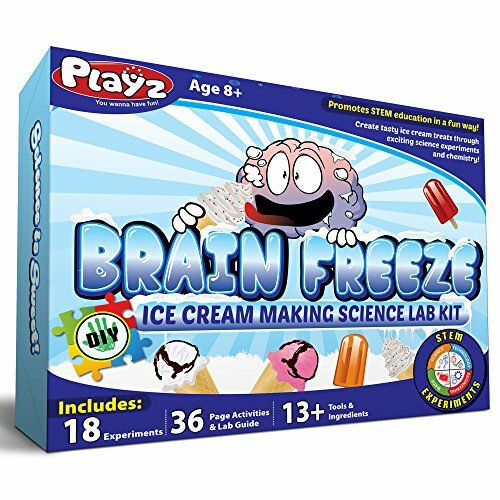 This set comes with everything kids need to make 18 experiments including invert sugar crystals, instant ice, and a variety of types of ice cream in a variety of flavors. The 36-page guide is easy to follow and included in the kit is tools and ingredients, though some additional ingredients are necessary, but probably already in your house. 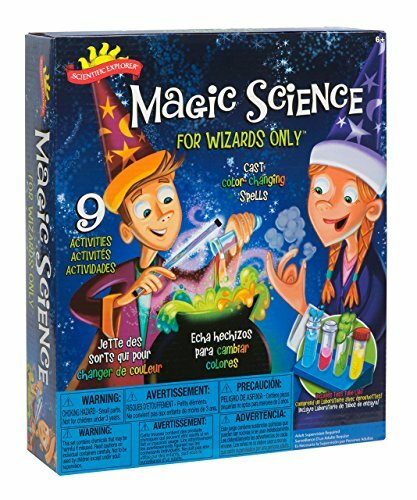 This set is for the older kids at least 8 years old, and while it appeals to their imagination and stomachs, it also teaches them important science concepts such as volume, emulsions, ice structures and more. Experiments are fun and tasty. Teaches STEM concepts in a very fun way. Perfect for older kids and young teens. Can make 3 flavors: banana, vanilla, and strawberry. A little pricier than other kits on this list. Kids will be able to make some hocus pocus powder and a test tube crystal ball as well as some Feverish Fizz, a frothy foam concoction, and even glow-in-the-dark potion. Included in this kit are 4 test tubes with stand, a wizard wand, color tablets, zinc sulfide, citric acid, baking soda, cross-linked polyacrylate copolymer, red cabbage juice powder and more. This kit also includes paper to make a wizard hat too to complete the wizardry experience. Perfect for wizards and kids with a big imagination! The fizzing and bubbling experiments worked great. Kids especially loved making crystals for the wizard wand. Some of the experiments can get a bit messy. Does your young child aspire to be a mad scientist? Then check out this laboratory kit! If you are looking for something for your preschooler, this kit provides them with all the tools they need to start experimenting! Great for ages 3 and up, this set comes with everything little ones need to explore the world around them. This set comes with 24 easy-to-hold large science tools including test tubes, magnifier, measuring spoons as well as 10 experiment cards and a short 16-page guide to read along with your kids. This set is perfect to get kids started and interested in the world of science. Great for little hands. Easy to use. Simple set allows kids to use their imagination. The short guide will keep kids engaged. Might not be worth the price. This basic kit is priced a little higher than some may like. What kid doesn’t like things that go boom? Kids will love making a rocket balloon, candy comets, fizzy bombs, lava lamp and more. The 36-page lab guide is easy to follow and the experiments kept kids engaged and excited for more. 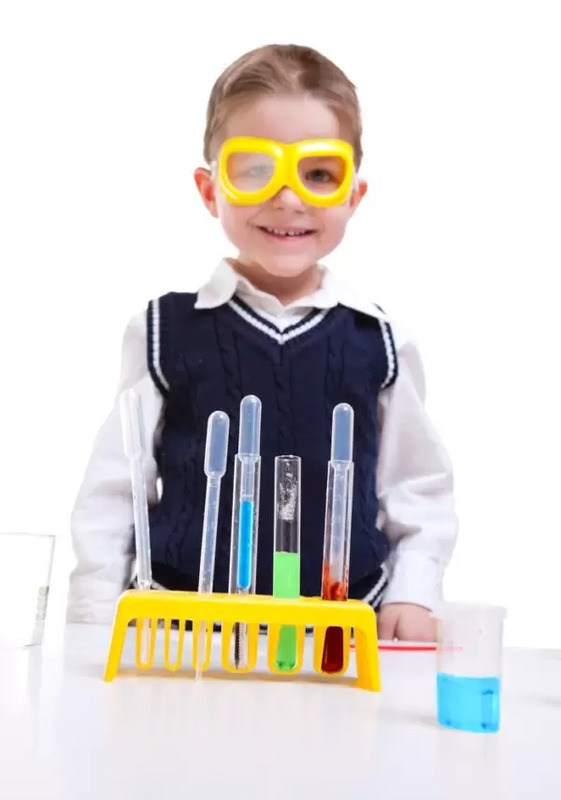 This kit comes with protective goggles and gloves, sodium bicarbonate, citric acid, salt, iron powder, red and green food coloring, funnels, test tubes, and more. Exciting experiments keep kids attention. Instruction guide was easy to follow. No frills. Just the basics. This set includes just the tools kids need to be a scientist. The rest is up to your kids and their wild imaginations. 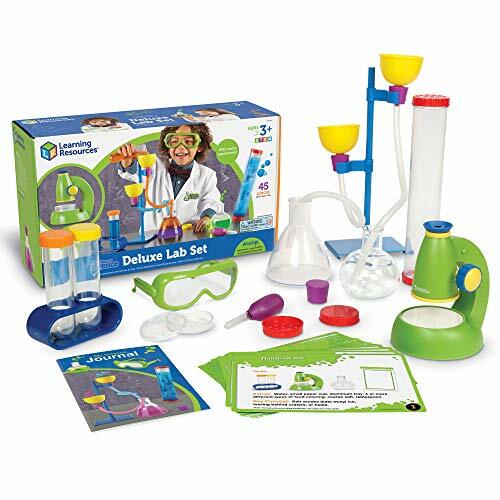 This set is great for preschoolers and comes with a microscope, write and wipe journal, flasks, test tubes, goggles, funnels, eye dropper, twisty connector tubes, sensory tube and more. There are also 20 activity cards to give kids ideas. There are no “ingredients” in this kit. Kids will need to use supplies they have at home. This kit is perfect for really young kids (age 3 and older). Great for young kids and preschoolers. Large set has everything to get kids experimenting. Experiment cards give good ideas and are easy to follow. ViewScope is a great intro to microscopes. Tools only. Does not come with anything to do experiment except for tools. Geysers, volcanos, dinosaurs, oh my! With this set, kids will be excavating dinosaurs and exploding a clay volcano over and over again. 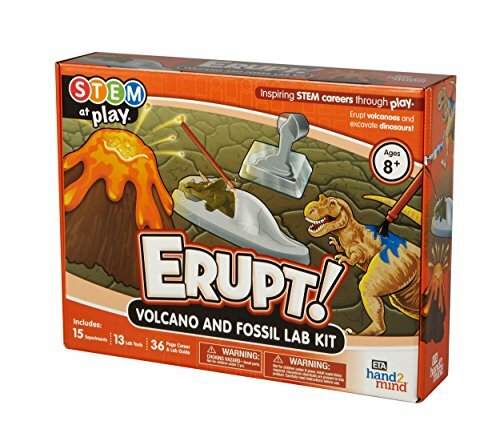 This set has 15 STEM activities including build, paint and erupt a reusable volcano. make a model of the earth, fossilize a dinosaur and more. This interactive set is for ages 8+ and parental assistance may be needed. The downside is that while some material is not included but easily found at home, there are many experiments that have materials you may not have on hand, for example, balloon, world map, and flexible tubing. The volcano can be used again and again. Kids loved excavating the dinosaur. Included lab guide that was interesting. Some set up is required. This science kit is packed with everything your child needs to become a chemist. 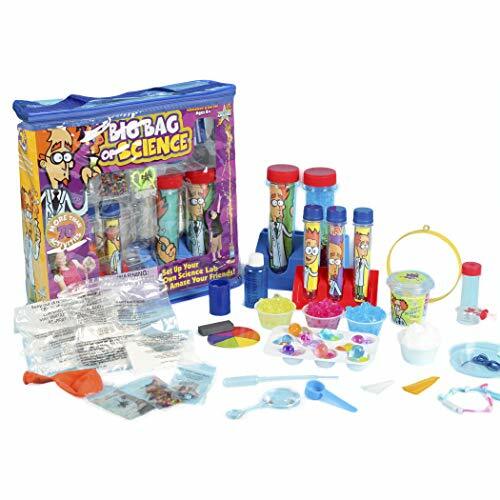 Included in this set are goggles, test tubes, syringe, storage containers, a periodic table chart, Petri dishes, beaker and much more. The chemicals included are safe and the set is appropriate for ages 5 and older. There are instruction cards on how to make 12 experiments. Some experiments your child will be able to make are elephant toothpaste, slime, wiggly worms, invisible ink and more. Some household items are needed for some of the experiments, such as lemon, salt, vinegar, and others. Comes with wipeable experiment notes and clipboard. This durable set will last through many experiments. Comes with over 50 science tools. There are a lot of great science kits out there that will spark your kids interest in science. Here are a few kits that didn’t quite make this list but are definitely worth a mention! Learn the basics of genetics and DNA. 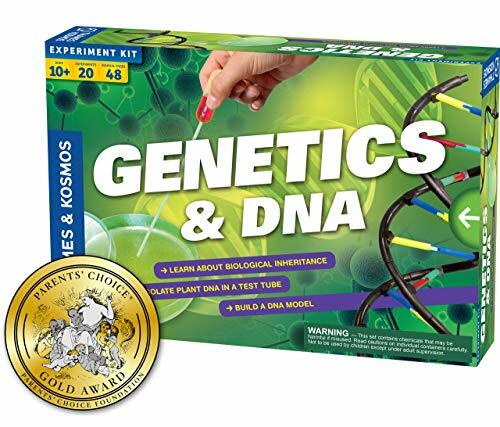 This kit is for much older kids (ages 10 and up) but provides a fun intro to DNA and genetics by using a tomato. Kids will also be able to grow bacteria so they can experiment with genetic engineering. Definitely a more advanced kit, but one that science-loving kids will enjoy. Kids will be able to build a stethoscope and listen to their (or your) heartbeat all while learning how the heart works. Kids will also be able to do experiments on lung capacity, fingerprints, as well as take a dive into learning more about the five senses. This kit is for ages 5-7. This kit does just one thing: grow crystals. However, this kit is sure to amaze your child! 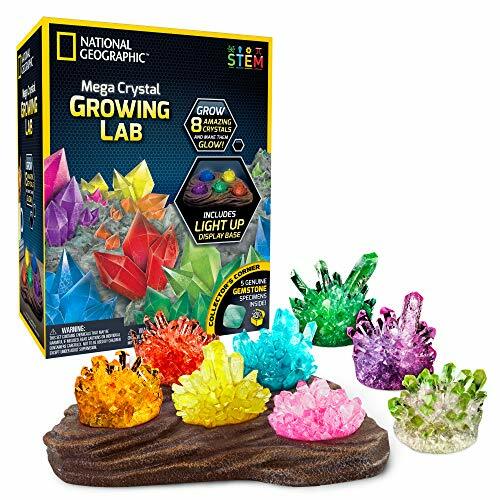 This kit has everything your child will need to grow 8 crystals, each with a different color. It also comes with an in-depth informational guide and a night light display so your child can show off his or her creation. This kit works for kids 8 years and older. Q: How old does my child have to be in order to have a science kit? 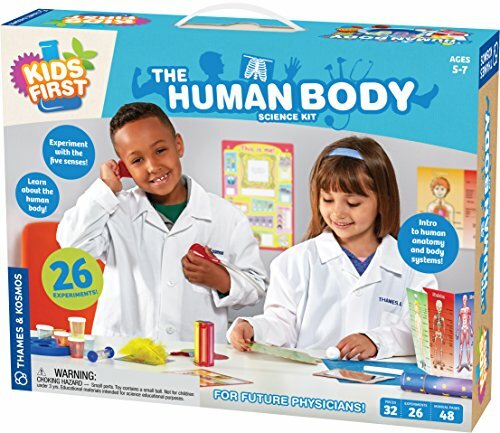 A: There are science kits out there for kids as young as 3! Many of the more advanced kits that include experiments start around 6 years old. However, the science kits for kids even younger than that are a great way to introduce young ones to science and get them exploring. Most experiments involving chemicals and more advanced skills start around age 6. Many of the kits on our list suggest adult supervision. Q: Do I really need to buy my child a science kit in order to do experiments? A: A science kit is not a requirement in order to start having your kids do science experiments. However, science kits are an affordable and convenient way to fuel your kid’s interest in science. Most sets come complete with everything you need to get started, but also come with instructions and other learning tools and complete the scientific experience. Q: Are science kits safe for young kids? A: Yes! All the science kits on this list have safe chemicals and tools. But be sure to check the age on the kit. While they are all very safe for kids, some are more suitable for older kids (8 and up) because they feature things that ooze, fizz, explode or require skills that younger children may not have developed yet. So now that we’ve taken a look at STEM, what to look for in a science kit and the 10 best kits out there on the market today, it’s time for you to choose. Will your aspiring chemist need a new laboratory to make his potions and slime? Or will your future geologist create crystals or explode volcanos? 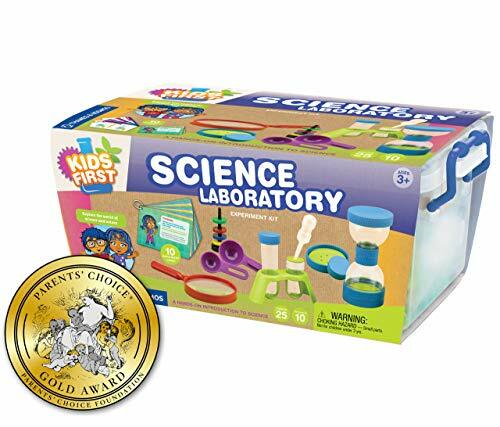 If you are looking for a science kit for your preschooler, the Kids First Science Laboratory kit is an excellent choice. Simple, easy-to-use science tools allow your child to explore and experiment while providing them a great introduction to science. 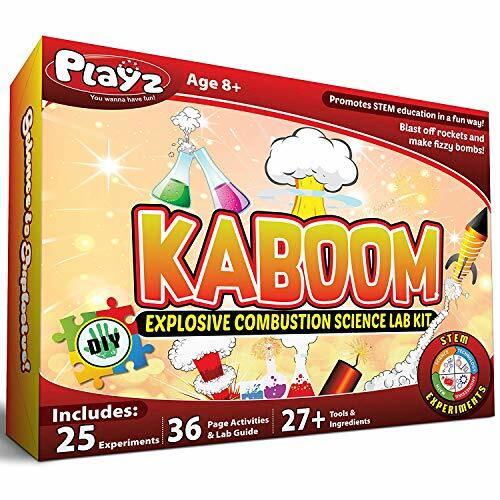 If your child is a little older and looking to do some serious experimenting, then Scientific Explorers My First Mind Blowing Kit and the Playz KABOOM! Explosive Combustion Science Lab Kit will keep them interested, highly-entertained and of course, learning.